TERRA NEW YORK is a new, smart and innovative rainwear company created by a duo of designers, marketing professionals, and bicycle lovers. As the label to offer fashion-forward and functional rain gear—to the urbanite as well as the bike-savvy suburbanite! 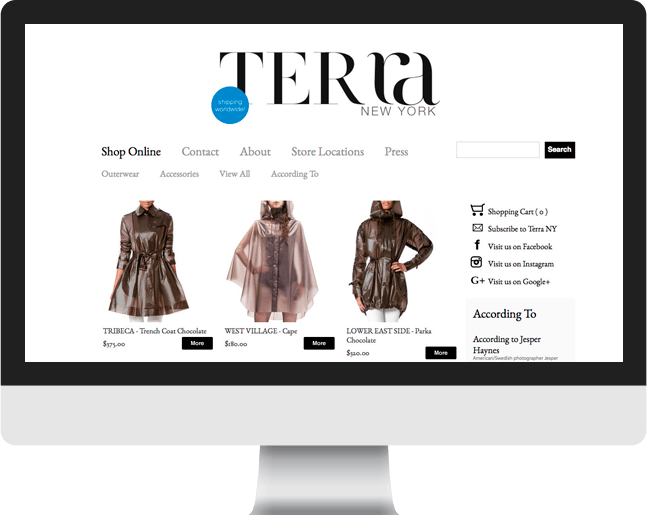 Cultura Interactive was hired to create a custom, clean and aesthetic Shopify theme for Terra New York’s e-commerce website. We developed this e-commerce website that would not only showcase the company’s products in a clean and trendy way, but would also create a user-friendly environment for customers to browse and make purchases. Shopify gives you your own storefront to sell your products on. By logging into your Shopify admin, you can manage and edit your store’s content, add new products and even accept payment from customers. Shopify will also host your site on our fast servers and set up SSL, so you don’t have to worry about the technical stuff.